Steven Soderbergh took a sabbatical. Now he’s back. And we are all better for it. His latest take on the heist movie is LOGAN LUCKY. Soderbergh has famously explored this genre before with the OCEANS series. Now he’s taking a shot with a heist that in the movie is called “Oceans 7-11”. The Logan from the title refers to a family made up of Channing Tatum, Adam Driver and Riley Keough. Tatum is the older brother Jimmy. A former high school football star who ruined his knee. Driver is Clyde who went off to fight in Iraq and lost his left hand. Keough is Mellie who is a hair stylist with a scary knowledge of traffic patterns. The Lucky part is ironic. In the film Driver explains how the family is anything but lucky by detailing their misfortunes. The audience is lead to believe they are just a bunch of screwed up West Virginia rednecks. Jimmy is divorced with a “cute as a button” daughter (Farrah Mackenzie) and an ex-wife (Katie Homes). Jimmy loses his construction job. That sets in motion the series of events that lead to a plan to rob Charlotte Motor Speedway on the weekend of the Coca-Cola 600— one of NASCAR’s marquee events. Given the family’s history you wouldn’t be wrong in thinking this is never going to be successful. Ah, but Jimmy is smarter than we are lead to believe and they hatch a remarkable plan with the help of expert safe cracker Joe Bang (hilariously played by Daniel Craig) and his two brothers. The film sets up expectations then smashes them to bits. All the while it makes you laugh. Not chuckle, but gut busting guffaws. This is one hysterically funny movie. Soderbergh and screenwriter Rebecca Blunt (more on her later) poke fun at the image of the redneck then turn the stereotype on its head. Jimmy is a sweet and caring father. Tatum hits the notes perfectly. Driver’s performance shows a real knack for subtlety and sly humor. Craig is having all kinds of fun, something he might want to think about bringing to his last turn as James Bond. The rest of the cast is great, including Dwight Yoakam as the local prison warden (did I mention they have to break Joe Bang out of prison and return him on the same day so no one knows he’s been gone— trust me, you’ll love that). The third act has a few twists that are surprising and satisfying, yet also leave you wondering just how successful the heist really was. That brings us to Rebecca Blunt. There are all kinds of rumors that she is not a real person. Even her IMDB page (Rebecca Blunt) questions whether she exists. Is it Soderbergh? Some other screenwriter ghostwriting? Maybe we’ll find out one day, but the script is solid. There’s a couple of loose threads that you shouldn’t worry too much about pulling on. 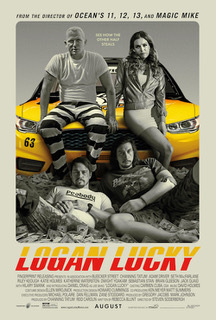 They won’t ruin your enjoyment of LOGAN LUCKY. Just sit back and enjoy a fun, funny movie and be glad that Soderbergh is back making movies.